Krusty the Clown is the chain-smoking, gravelly voiced clown with a pacemaker on The Simpsons. He hosts his own kids' show, which Bart watches faithfully. 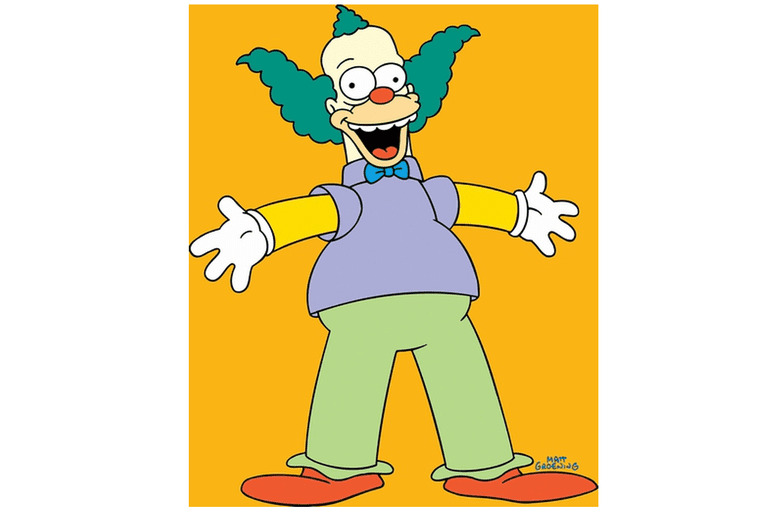 What makes Krusty hilarious is that he is the last person who should be a kids' clown. Over the years we've learned a lot about Krusty the Clown. He's a fantastic character, and these are his most revealing episodes. In the very first season of The Simpsons, we get to peek behind the scenes of The Krusty the Clown Show, and it ain't pretty. Homer witnesses a robbery at the Kwik E Mart and identifies Krusty as the thief. After Krusty is convicted, Bart and Lisa investigate the crime, only to discover Krusty couldn't have robbed the store. The security video shows Krusty using the microwave, but Krusty wouldn't do that because he wears a pacemaker. Plus, Krusty wouldn't be reading at the magazine rack because he is illiterate. Finally, Homer accidentally stepped on the clown's big feet during the robbery. But Bart realizes Sideshow Bob, who has giant feet, is the culprit because Krusty wears big shoes but has normal-sized feet. Original air date: April 29, 1990. Favorite quote: Bart says, "Krusty wore big floppy shoes, but he's got little feet like all good-hearted people." At a Simpson family dinner, Krusty reveals his real name is Herschel Krustofski, and that he is not only Jewish but also sadly estranged from his father, Rabbi Krustofski. Bart and Lisa repeatedly ask the Rabbi to reconcile with Krusty, only to be rebuffed. When Bart eloquently quotes Yes I Can by Sammy Davis, Jr., Rabbi Krustofski finally agrees to see his son. Guest star: Jacki Mason. Original air date: Oct. 24, 1991. Favorite quote: Lisa says, "A man who envies our family is a man who needs help. We don't see a lot of Krusty in this episode, but that's the point. Bart finally realizes his dream of attending Kamp Krusty, only to discover the camp is a sham. The kids are fed imitation gruel, put to work and forced to do dangerous stunts. When Mr. Black tries to pass off Barney as Krusty, Bart leads a revolt. Finally, Krusty shows up and, tearfully, apologizes to the kids. Then he takes them all to Tijuana. Original air date: Sept. 24, 1992. Lisa: "I feel like I'm gonna die, Bart." Bart: "We're all gonna die, Lis." Krusty's show is canceled when a ventriloquist and his dummy, Gabbo, steal Krusty's TV ratings with their hit show. Bart and Lisa find him homeless and decide to help. The family takes him in while he gets back into shape. 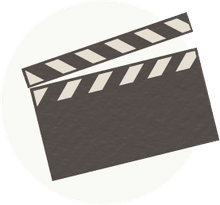 Then Bart sneaks into the studio while Gabbo is taping and turns on a camera, which broadcasts Gabbo saying horrible things about his audience. With Gabbo gone, Krusty and the kids put together a TV special, starring Bette Midler, the Red Hot Chili Peppers, Hugh Hefner, Johnny Carson and Luke Perry. The special is a smash hit and Krusty gets his show back. Guest stars: The stars as themselves. Original air date: May 13, 1993. Favorite quote: Krusty says, "Thirty-five years in show business, and already no one remembers me. Just like whats-his-name and whos-its and, you know, that guy, who always wore a shirt." In order to pay off his gambling debts, Krusty opens a clown college. Homer sees a billboard advertising Krusty's school and signs up. He graduates from the clown college, even though he can't perform the Spin Cycle Fantastique trick. People all over Springfield mistake him for the real Krusty, including Fat Tony. Homer is kidnapped and taken to Don Vittorio to pay for Krusty's gambling debt. Don Vittorio declares he will spare Homer's life if he performs the Spin Cycle Fantastique. Krusty shows up in time to perform the trick with Homer, and Don Vittorio spares their lives. Guest star: Joe Mantegna as Fat Tony. Original air date: Feb. 12, 1995. Krusty bombs at a big comedy benefit in Springfield. His jokes are outdated and offensive. He goes on a bender and winds up in the Flanders' front yard. Bart takes him in and convinces Jay Leno to coach Krusty. Krusty still isn't able to update his material and goes on a rant about modern comedy. His negative commentary is a hit. He makes a comeback as a stand-up comedian, telling it like it is. Until that is, he's offered a ton of money to endorse the Canyonero. Krusty goes back to selling out. Guest stars: Steven Wright, Janeane Garofalo, Bobcat Goldthwait, Bruce Baum, Jay Leno and Hank Williams, Jr. Original air date: Feb. 22, 1998. Todd Flanders: "Wow, a clown! Do you think he's evil?" Rod Flanders: "He smells evil." At a book signing, a little girl named Sophie tells Krusty he is her father. Krusty takes the girl to the beach for some bonding. At sunset, she plays the violin for him. Later, Krusty loses Sophie's violin during a poker game with Fat Tony. When Sophie finds out, she realizes she was better off not knowing him. Krusty feels terrible and convinces Homer to help him steal back the violin. They succeed, but Homer winds up on the run from the mob. Guest stars: Joe Mantegna as Fat Tony; Drew Barrymore as Sophie. Original air date: Nov. 12, 2000. Favorite quote: Sophie says, "You know, for a clown, you're not really a lot of fun." The Simpson family helps Krusty get elected because they have their own agenda to re-route the airport flight path. After Krusty is elected, he quickly becomes disheartened by the system. No one will listen to him about having the flight path moved. The Simpsons find Krusty in a bar and decide to enlist the help of the congressional janitor to blackmail and trick their bill into getting passed. Finally, Lisa paperclips their flight path bill to another and it passes. Original air date: March 9, 2003. Favorite quote: Krusty says, "I swear to uphold and protect the Constitution of these United States. So relax, gun nuts, I can't touch you!" Krusty discovers he doesn't have a star on the Jewish Walk of Fame because he never had a bar mitzvah. His father, Rabbi Krustofski, explains he didn't have one because he never took his studies of Judaism seriously. Krusty decides to do what must be done, which includes not hosting his own show on the Sabbath. He picks Homer to take over as guest host, thinking Homer will bomb and keep his job safe. But Homer's a hit and Krusty gets fired. He convinces Fox to air his Wet 'n' Wild Bar Mitzvah so he can make a comeback. Meanwhile, Lisa convinces Homer to use his new TV stardom to talk about important issues. As soon as Homer takes Lisa's advice, he's fired. Because Krusty's special is a hit, he's hired back to host his show. His father, however, was disappointed that Krusty didn't have a real bar mitzvah. Krusty agrees and winds up reciting the Talmud perfectly at temple. Guest star: Jackie Mason as Rabbi Krustofski. Original air date: Dec. 7, 2003. Krusty's decision to retire after he’s offended by a comedy cable channel roast of him has dire consequences for his father, who has a heart attack and dies. Original air date: September 28, 2014.